Alfred Hitchcock Presents gave its producer a chance to stretch out and mess around with new ideas. For Orson Welles, RKO Studios was “the biggest electric train set any boy every had.” But for Alfred Hitchcock, who tested film ideas on his long-running show Alfred Hitchcock Presents, it would seem that, for him, television was the greatest sandbox. On March 16, 1958, the AHP episode “The Foghorn” aired. You could call it a sandcastle variation on his monumental Vertigo, which premiered two months later. Watch the full episode free on Hulu. 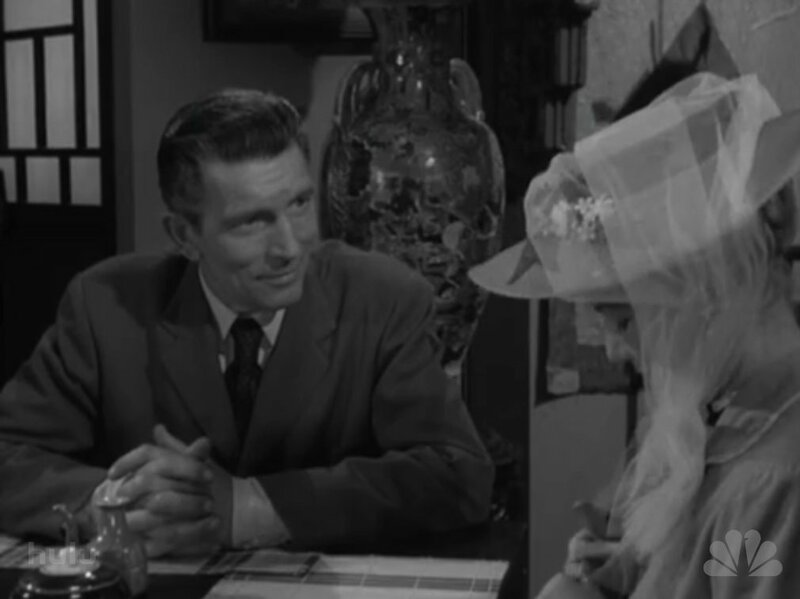 The episode starred Barbara Bel Geddes as Lucia, a young woman who falls in love with a married man, Allen Bliss (Michael Rennie). This being the 19th century – and a 1950's TV show – their relationship remains fashionably chaste, frustrated by his wife's refusal to grant a divorce. Then one day they decide to go for a sailboat ride in San Francisco Bay, where they hatch plans to run away to “the fortunate isles” of "the Orient." 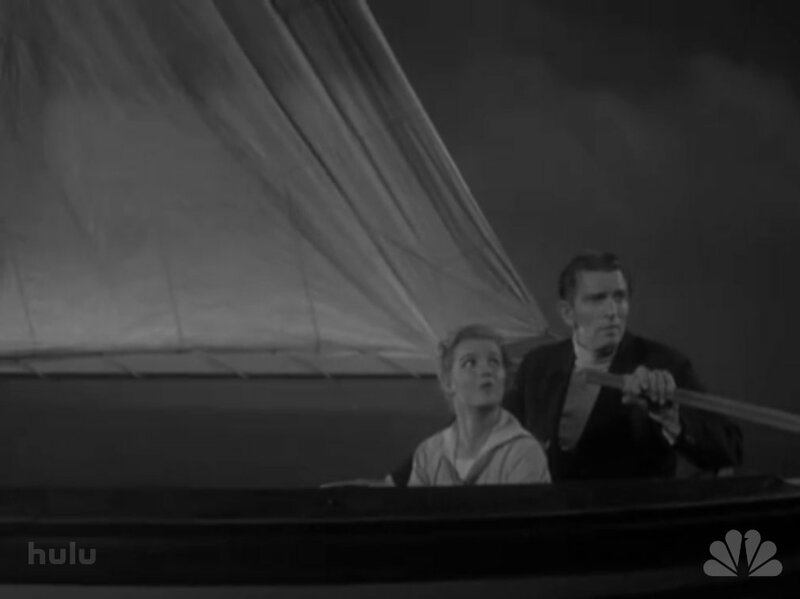 But their boat gets lost in the fog and they're struck by an oncoming ship. It capsizes and... well, I don't want to ruin it for you. But for the sake of this post, let's just keep in mind that the entire episode slips like a loose gear between hazy present and lucid-dreaming flashback. 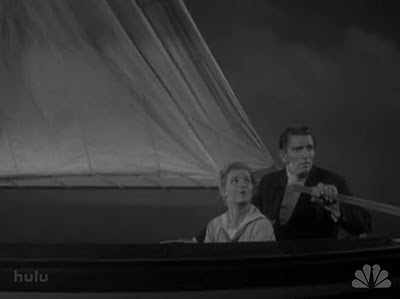 You might have already noted a resemblance between "The Foghorn" and the first half of Psycho, when Marion Crane (Janet Leigh) attempts to run away with her married husband to a "private island." But let's focus on Vertigo. For starters, Bel Geddes starred in both the TV show and the movie. Also, "The Foghorn"'s setting in Gold Rush-era San Francisco – with its mix of amoral greed, seafaring criminality and astonishing wealth, quickly obtained – is echoed in Vertigo's historic locations. In that movie, Gavin Elster's longing for the “things that once spelled San Francisco.... the color and excitement... the power... the freedom” – take us right back to the era of "The Foghorn"'s Forty-Niners. "The Foghorn" opens with the haunting image of a woman dreaming (see "Madeleine"'s "beautiful, phony trances" in Vertigo, as well as the opening scene, two decades earlier, in Rebecca). What follows is a flashback – or is it? That confusion of dreaming and reality also forms the diegetic core of Vertigo. Rolling in from the Bay, San Francisco's iconic sea fog envelops "The Foghorn" with a funereal, dreamlike atmosphere – similar to that in Vertigo. Bliss even looks like Elster. Of the latter, Vertigo's screenplay says that he has "cool, watchful eyes. 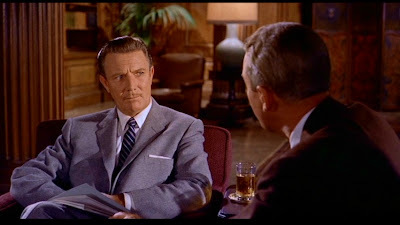 He is beautifully tailored, and gives the sense of a man who relishes money and knows how to use it." The same could be said of Bliss. In Vertigo, the uncanny shock of recognition strikes most jarringly when Midge shows Scottie her self-portrait. "The Foghorn" ends in a similar "big reveal" plot twist. In both the film and the TV episode, a nun looms up like a specter, to shocking effect. Both end in a dying fall, too. The "The Foghorn"'s resonance doesn't end there. 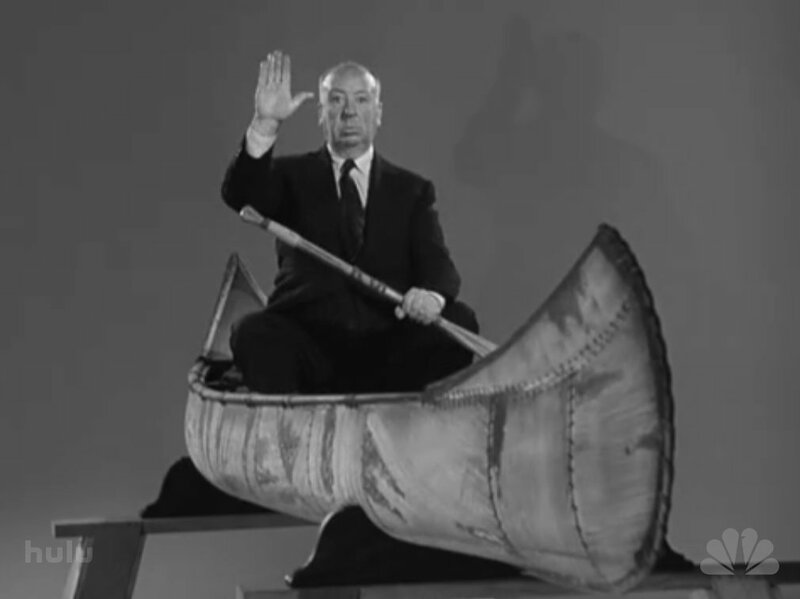 Hitch mined the Gertrude Atherton short story on which the AHP episode was based for ideas for Vertigo. Stop back for my next post and see what I mean! Thank you for the link! I agree with you about the Vertigo connection. The thing that struck me was how Bel Geddes is framed like Carlotta's portrait in the opening. The frame transposed over her sick bed-- while she lies like Stewart in his nightmare sequence after Madeleine's apparent suicide. Bel Geddes (Lucia) in the story is also 26 when she meets Bliss, the same age as Madeleine/Judy (Carlotta). And meets a symbolic death--by dreaming her life away. It seems that the only way her Chinese ring wish for happiness could be fulfilled is by happily dreaming for 50 years in the hospital run by nuns. She wakes up to a nightmare of old age and decay. Another Vertigo touch it was a nun who actually startles Judy Barton into jumping off the church tower. Here we have a nun tending to a Lucia who is only startled into madness--this might have been an alternative ending to Vertigo that Hitch was playing around with. There are also touches of Lifeboat, with the incoming ship. Shadow of a Doubt, with the opening waltz scenes. And strangely enough The Philadelphia Story, with someone who looks like Stewart from the back, when the two lovers are looking at books in the library-- here Bel Geddes stands in for Hepburn. At least those were the playful ideas that occurred to me while watching the episode--some may be right, others wrong. But, those were the ones that occurred to me while watching. Jeff - fantastic observations! Thanks for checking in. Indeed, one of AHP's better episodes. It's pretty clear that she's just now recalling what happened - they make sure to note that she's about to die by pointing out that people like her become lucid near the end. If anything, the peace is that she didn't have to live for long with the full knowledge of what happened. Wish the links still worked as I'd love to read the story.